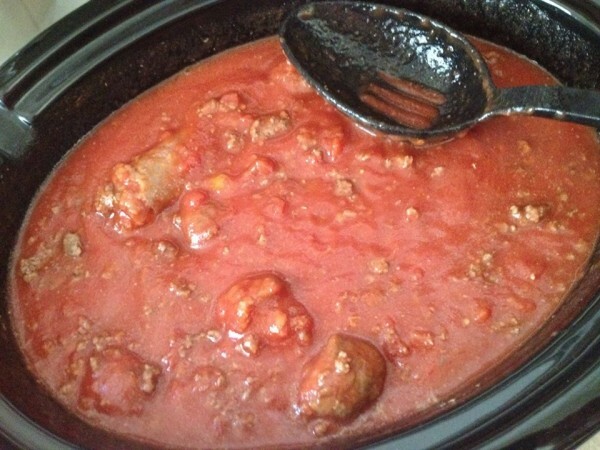 This is our favorite spaghetti sauce recipe. I always make it in a crockpot in the morning and let it cook on low for at least 6 hours, so all the flavors can blend. Garlic & wine seasoning, which I purchased at the Melting pot. You can use garlic powder as well. I start browning the ground beef and also take two of the sausages out of their casings and brown it with the beef. You can buy ground sausage as well. It’s all a matter of preference. At this point I thrown in a couple of sausage links, cut in halves or thirds. I like to cut mine and eat it in chunks. While this is all browning, I put all the cans of tomato sauce/puree into the crockpot. I swish water around in each can to get all the sauce out and pour into crockpot. I shake a good amount of each seasoning into the sauce in the crockpot I use fresh Rosemary from the garden. I just eyeball all of this. You can play with it and see what flavors you like. Then give it a stir. At this point I add in some ready made italian meatballs. When the ground beef/sausage is done browning, I drain the grease and add to the crock put. Give it a good stir. Cover and let it go.